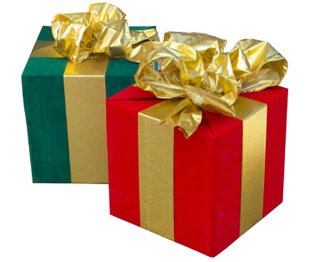 Happy Christmas and happy barefooting! Surely the best ever Santa and his faithful "reindeer"...barefoot of course! Have a VERY happy Christmas and a wonderful 2013 from all of us in soggy Rockley! 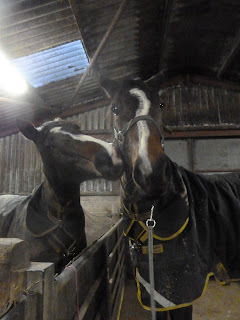 I haven't posted updates on any ex-rehabs for a while but lots of good news has come in over the last few weeks and good news about my "old boys" and "old girls" are the best Christmas presents I could wish for. I don't have photos, but there is good news on Thomas, who went home at the end of November - both his owner and vet are pleased with him and his physio has - for the first time - not had to give him any treatment. 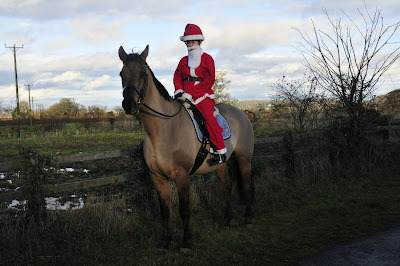 He's been working very well under saddle, Emily reports, and we all have high hopes for how he will get on next year. Roo, who went home in the summer is also on great form. Her owner has had to keep tight control of her diet, as she has proved to be sensitive to grass sugars but the Laminitis App has proved a useful way of keeping one step ahead of things and she is now going from strength to strength. Like Tom, her physio is very pleased with her - its always a good confirmation of comfortable feet if the rest of the body is loose and supple. Knightley has settled in very well with Cristina, where he has gone on loan, and Dexter - also on loan -is having an equally good time with Emma, in Oxfordshire. No photos, but I hope to have some after Christmas. New boy Remi arrived at the weekend. As always, I'd heard a lot about Remi from his owner and his vet but its only when you finally see the horse in front of you and watch him move that you get the real picture of what is happening with his hooves. Despite the internet being sloth-like, I've managed to get his footage up, so here it is - let me know what jumps out at you! You'll have to excuse the shortage of photos but the internet is on a go slow and so I've just added the bare minimum - a couple of updates for Susie and Cathy about their boys, Beano and Dave. Beano has been here now for 2 weeks. He was already barefoot but with a relatively weak palmar hoof. I thought his feet would change even more rapidly than usual and here we have the proof - a much stronger frog already. With Dave, the update isn't so much about his feet, though I will get photos up as soon as I have a faster broadband connection. 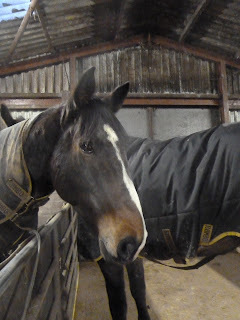 He is a huge horse - over 19hh - and is only young so its no surprise that he is very weak behind. One of the challenges with him, in addition to his feet, is to allow him to start building more muscle and better proprioception. I apologise for the darkness of these photos - a function of the time of year I am afraid - and the fact that I've chopped Dave's head off in the lower one, but I hope you can see that he gradually becoming a better shape and is putting on a bit of muscle, though lots more is needed! I've been wanting to post new photos of Rocky for a few days but it was tricky getting the right comparison shots. As his owner said, before he arrived, he has a lot in common with Zan, who was here last year - also chestnut and also with hooves that desperately wanted to help balance his limbs. What's interesting with Rocky is how his limbs have loaded differently as his feet have changed. The top photo is day one - he had pulled off his remedial shoes a few days before these photos were taken and before arriving at Rockley. Here he is a few weeks in - still with most of his lovely summer coat and with feet that are starting to look as if they are up to the job of supporting his limbs. 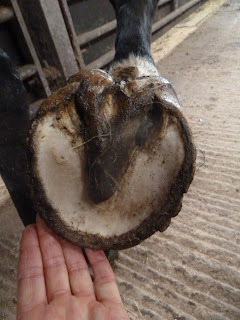 And today, with a much shorter hoof capsule which is still more supportive than it was a few weeks ago. 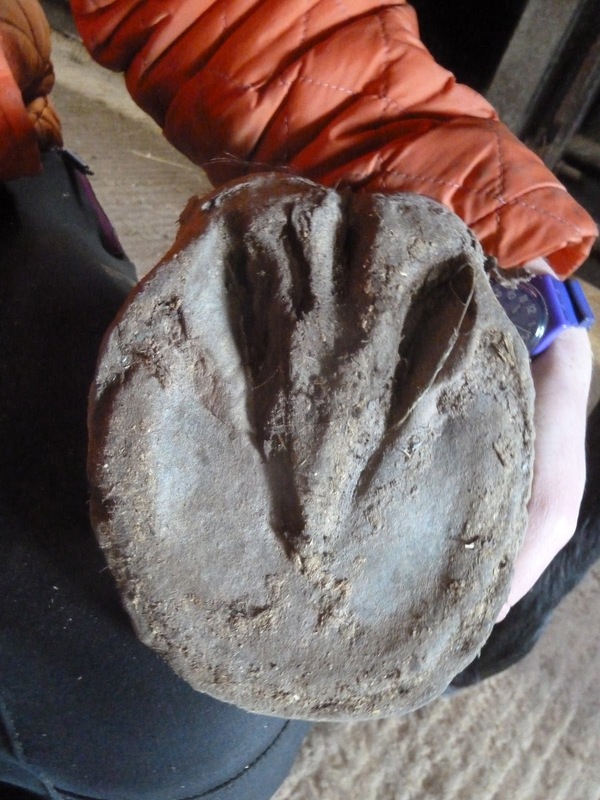 The clue is that his legs are straighter and the hooves look more balanced, whereas is the earlier photos a line drawn down the limb would be weighted much more towards the medial aspect. These photos are a good illustration of why a symmetrical hoof can only be judged in the context of the whole limb and how the horse moves. You could trim all you want and make the foot as pretty as you like. If it doesn't support the limb then the whole pack of cards is in jeopardy! I thought I would post these photos following on from the comments I had on Monday's post. 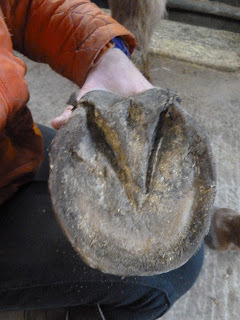 The fact is that hooves can change very quickly, and certainly much faster than the months which we are told it takes in textbooks to grow a full hoof capsule. Buddy has been here nearly a month and he had terribly flat feet when he arrived as you can see from looking at the shallowness of his collateral grooves. This is his better foot but you can already tell that it is a much more "functioning" foot than it was. 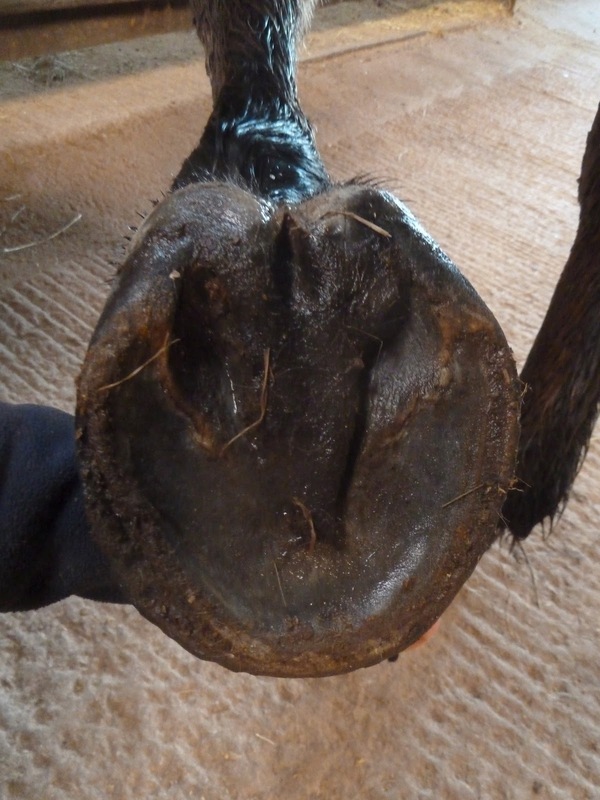 From the lateral view you can see his long toe and under-run heel and that the hoof pastern axis isn't right. In a month he hasn't grown that much hoof but already, if you compare, what IS growing is at a new angle. This is his worse foot and the foot with the most contracted heel and frog. Again it was very flat and as always the external reference points for assessing sole depth are the collateral grooves, which are improving in the photo a month further on. As with his LF, there is a new angle of growth on his RF too and to my eyes the bulge in the hairline is also starting to improve. Buddy has been in gradually increasing work for a couple of weeks now and so far so good - things are heading in the right direction. A quick blog "heads up" today, as I've had a few emails over the last week from people whose horses have become footy - most likely due to frost and consequently high levels of sugar in grazing. Most of us have got cold, clear, frosty weather - very beautiful but do be careful! 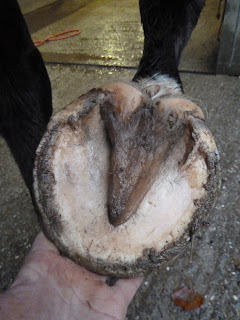 Those of you with the laminitis app will already have noticed some big spikes in risk - we have one at the moment though we've been fine up till now - so be cautious with your grass. Alfie the Morgan has been here now for 8 weeks and its time for another update. 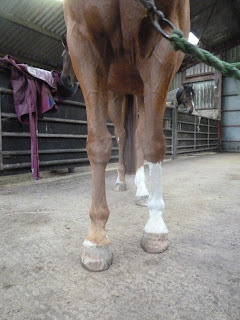 He was diagnosed with DDFT and impar ligament damage along with navicular bone damage and coffin joint arthritis. 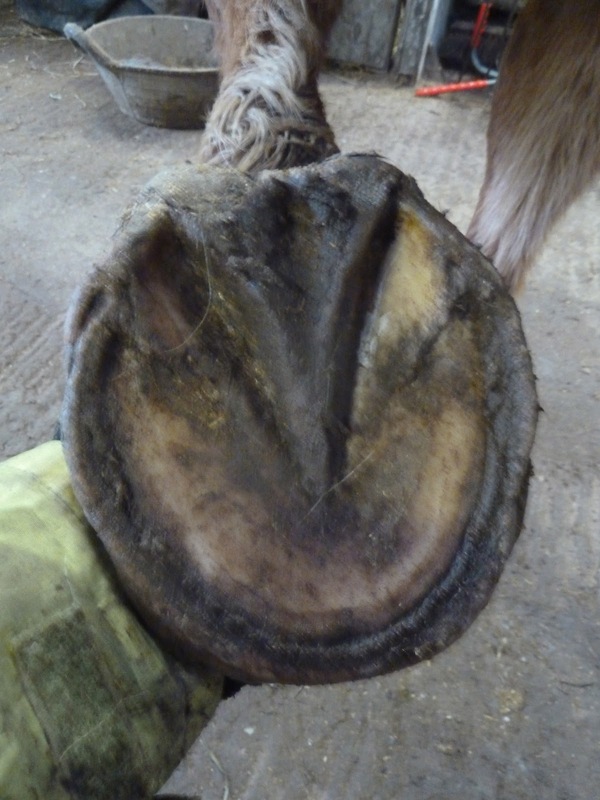 There is general agreement that horses with this type of diagnosis require "support" in the area where the pain is - the back of the hoof. 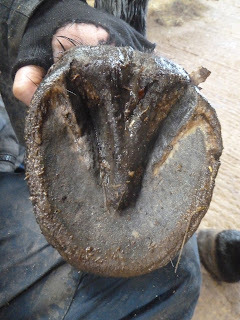 Frequently, remedial shoes are seen as the way to provide this "support" but the irony is that the hoof will itself build a more supportive palmar hoof if it is given half a chance. These photos - taken over 8 weeks - show how this happens. 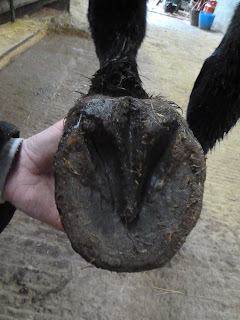 Look how much more substantial the previously weak area is becoming - and the foot is less under-run and has a better hoof/pastern axis as a result. With correct, comfortable stimulus the horse is happier to engage and land on the back of the hoof. This in turn starts to work the frog and digital cushion and in response they develop and become stronger, encouraging more engagement, a better landing. What was a vicious circle (pain, toe first landing, DDFT and impar ligament damage, pain, toe first landing etc) becomes a virtuous circle: comfort, heel first landing and giving the tendon and ligament damage the chance to heal as a result. These sole shots show how the frog and heels are developing - an integral part of the process. This can happen very quickly - remember this is less than 2 shoeing cycles. It would be interesting to see comparative photos of the foot changing during a similar period of remedial farriery! ...there is nowhere better to be than out hunting on Exmoor. In deference to the fact that Andy and Charlie hadn't hunted since opening meet we had a short day yesterday but it was absolutely gorgeous. The day began with an incredibly generous lawn meet which we hadn't expected (so I hadn't plaited - oops!) at which we all overdosed on hot roast potatoes, sandwiches, sausages and cake, not to mention port and whisky. The Stig had his boys out and they were on blistering form. Watching them flying across the most impossible terrain so fast that you would think they were running on smooth, level turf just takes your breath away. 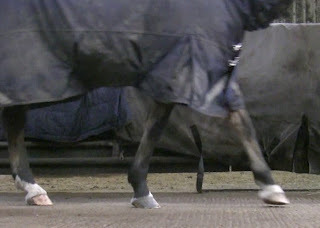 I posted some high definition footage of shod horses a couple of days ago and as if to echo this there was an article posted from The Horse magazine entitled: "Human Barefoot Trends - what can they tell us about horses?". Since the research into barefoot in humans is overwhelmingly in favour, as it improves biomechanics and reduces injury, you would have thought that the article would reach a foregone conclusion - but no, it was still quoting not research but the opinion of vets and farriers that - guess what - horses need shoes - once again for that all-important, mythical "support"! "I still can't believe how often I hear the word 'support' in relation to the use of shoes on horses. I can certainly understand the problems presented when it was discovered that the world wasn't flat, I just wish our so called enlightened society would be a little more open minded instead of being so determined not to be duped that intelligent people just don't want to hear logic any more! " She is absolutely right, of course but (though I used to find it frustrating) nowadays when I hear the "shoes provide support" statement, I try to keep it in perspective. 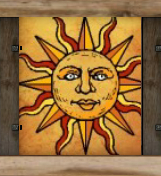 After all, Nicolas Copernicus' and Galileo's ground-breaking proposition - that the earth orbited the sun, rather than vice versa - was initially preposterous to the scientists and society of their times. Most people firmly believed that the earth couldn't possibly be spinning around the sun. This belief (like the shoes=support belief) wasn't based on scientific evidence: people believed it because they'd always been told that the earth was in the centre of their universe and it never occurred to anyone (apart from Copernicus and Galileo!) to question this assumption or subject it to scientific testing and scrutiny - sound familiar? After a whole month during which neither me, Andy nor any of our poor neglected horses got out hunting - due first to the EHV scare and then to dire weather - it was a huge boost to get out yesterday on Felix. I think he had almost given up hope of seeing his beloved hounds in action again - but he had a look of dawning optimism on his face in the morning as I turned out every other horse but him. I had to be discreet because if Charlie had realised he would never have forgiven me but F entered into the spirit of it and did a cartoon tiptoe-up-the-lorry-ramp-as-quickly-and-quietly-as-possible so we could make our getaway. Not only was it a beautiful day - with real sunshine (no, none of the pics have been Photoshopped! )- but the Stig's wonderful girls were on fine form. Let's hope for many more days like this! Here's a fascinating high definition video that I first saw in 2011 and put on the blog then - there were some fabulous comments at the time. Its been doing the rounds on Facebook and I saw it again yesterday but it is well worth another watch. You need to listen to the commentary as well - the vet who is commentating is describing the "support" that the shoes are providing but - really - that's not what appears on the video. I find it hard to watch, mostly because of the medio-lateral imbalances and the tremendous strains being transmitted up the limb as a result. The veterinary hospital that posted this incredibly clear footage is a renowned US equine centre. Its praiseworthy that they - unlike many vet practices - are trying to gather the evidence on which to base their decisions. But for me there is a gaping hole in their research. They've forgotten that horses didn't evolve with shoes on and that shoes change how feet and limbs load, land and function. Evidence based veterinary medicine is undoubtedly going to be a huge focus in future and there is a desperate need for it. 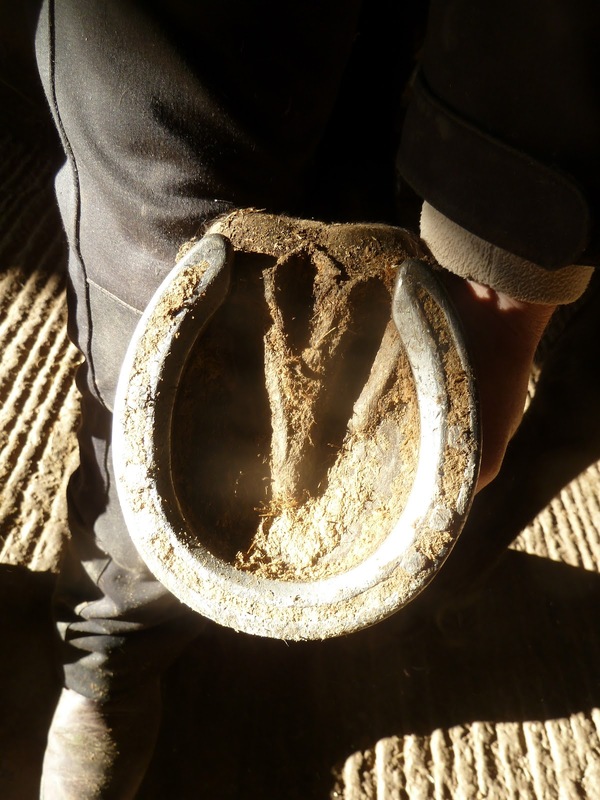 Before we put bar shoes, wedges, pads and other aggressive interventions on horse's feet, wouldn't it be a good idea to try and evaluate what good - or harm - they do? 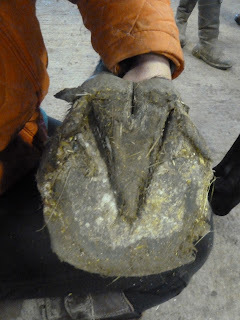 Certainly the radical and rapid development in feet that we see here as they come out of shoes suggests that shoeing is far from a benign management tool - and yet there are no comparative studies evaluating the physiology of shoeing in place of normal hoof function. As a starting point in the quest for evidence based practice, and rather than simply making assumptions that these invasive practices provide "support", surely vets - and farriers - should be looking for research? Being devil's advocate, its all very well to call for evidence for barefoot, but barefoot isn't an intervention, is it? New boy Beano, a Trakehner, arrived yesterday. 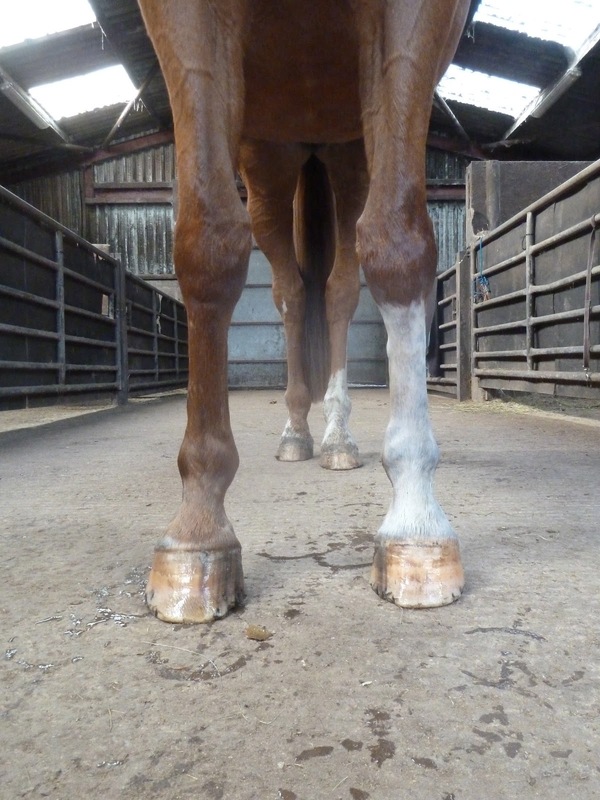 He has been diagnosed with navicular syndrome on the basis of x-rays and he is particularly interesting because he has been barefoot for a number of years. 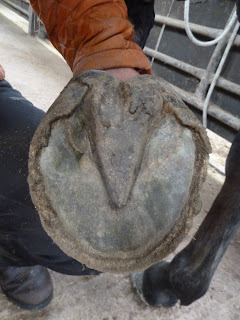 It used to be the case that all the horses coming here were shod - often in remedial shoes - but though we still have a lot of those, its increasingly common for horses to arrive already out of shoes as owners try taking their horse barefoot following the onset of lameness in the hope that it will help. Beano is unusual because he has been successfully barefoot in the past - though his owner reports that he was never totally happy on hard, stony ground and she (understandably) used boots for him to keep him comfortable. His lameness is fairly recent and though his feet are a lot better than some he has a tell-tale weak palamr hoof and long toe. I suspect that - like most horses who have been long term without shoes and working barefoot - he will develop those weak structures more quickly than a horse just out of shoes but time will tell! Why would you go anywhere else?! You already know that a good diet is one of the critical building blocks for a healthy hoof and its something that I mention a lot on the blog. I always send rehab horses home with a report on their hooves and work levels and, separately, a detailed feed sheet. The feed sheet is a "how-to" list giving practical tips on safe feeding for all horses from hardworking hunters to happy hackers and good doers to delicate flowers. 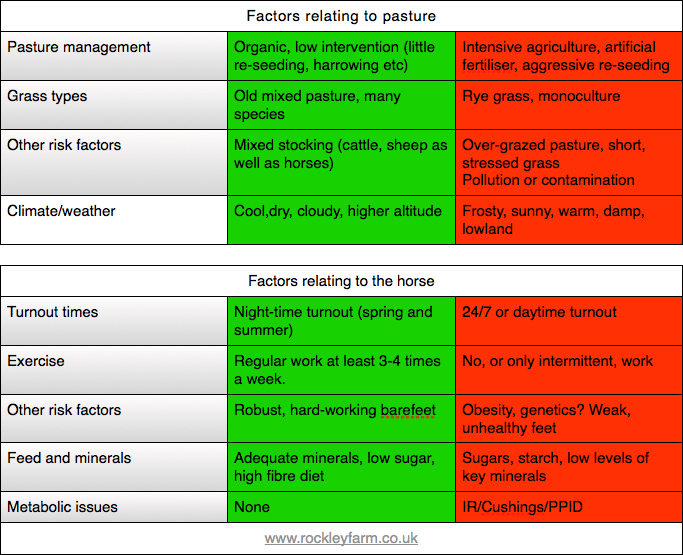 Historically I've listed the basics - forage, minerals and additional hard feed - because that's how feeding has evolved. Most commercial mixes and mineral supplements just don't cut the mustard and so owners (including me!) have had to source minerals and balance straights if we wanted optimum diets. That's been fine but it can be an awful faff, and while its not too difficult for someone like me with a yard of horses to feed who can use up industrial quantities of magnesium oxide it can be a nuisance for someone with 1 or 2 horses to order the smaller quantities of high-grade minerals they need. 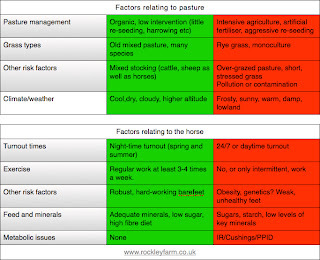 Equally, while forage balancing can be useful its not always a practical option and isn't always necessary. I'm always trying to find ways of making life simpler for owners - its scary enough taking back full responsibility for your horse once its home, after all, and anything which can make it easier for an owner or livery yard to maintain the best possible diets (whether for barefoot or shod horses) has to be a good thing. Step forward Progressive Earth, which I've been recommending to owners for a while and which really deserves top billing and a blog post all of its own! This is partly because Progressive Earth make really good mineral balancers - Pro Hoof and Pro Balance - which unlike most supplements do exactly what they say on the tin. These supplements are what I suggest to owners as a cornerstone of their horse's diet - both supply good mineral levels though Pro Hoof has some "added extras", like Yea-sacc. What I hadn't realised till recently (though I have no excuse because I've known Mel and Ross, who run it, for years!) is that they also sell pretty much all the high quality minerals you would ever need - separately and in manageable quantities. Add to that their in-depth knowledge of hooves and horses and incredible customer service (Orkney clearly boasts the fastest, most efficient postal system known to man) and really, why would you go anywhere else?! I wanted to post these photos yesterday for Thomas' owner, Emily, but its tricky to blog without electricity so here we go today instead. 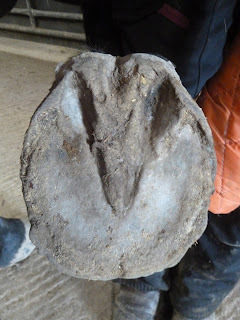 Its been a week with lots of hoof updates rather than more general posts, but that's just the way some weeks go! Tom has been here 9 weeks - he had been out of shoes for several months before he arrived. He was landing slightly heel first, which was good, but had issues with sole sensitivity and despite his landing had a weak palmar hoof. We hoped that some time on the tracks combined with work on varied surfaces would help take his feet a stage further. Here he is 9 weeks later - no trimming has been done at all but he has been allowed to move as much as he wanted on the tracks and has also been worked on the roads and tracks here as long as he was comfortable. Its still not a terribly strong foot but he is happier to load the back of the foot and he has much more development there too. His frog and heels were under-developed but he has made good progress in beefing up his frog and strengthening his heels. These photos are a good illustration of why correct work and stimulus are more important than trimming. A trim would have lowered the heels in the top photo, but that would have put more pressure on a weedy frog. In contrast, allowing him to work on stimulating surfaces has improved both frog and heels so that he has a better base of support and a better ability to shock absorb. We should be back on tomorrow - at least I hope so! Rolie is going home at the weekend and its time for his final update. 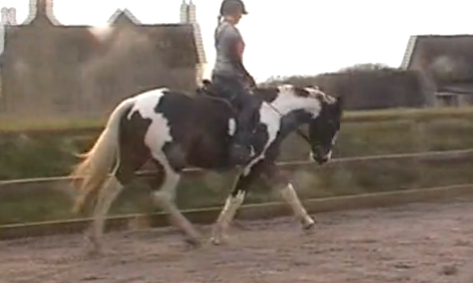 As regular readers know, rehab is rarely just a straightforward, smooth linear improvement and horses often have downs as well as ups along the way. This isn't surprising when you consider how extreme are some of the hoof changes that they undergo - and when you consider that changes in foot balance and loading inevitably also affect soft tissue in the neck back and shoulders. 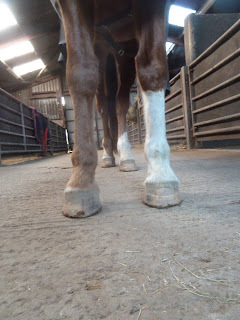 Rolie has been no exception to this rule and although he has made some great changes to his feet he has had a couple of "downs" along the way as well. Fortunately these have been short-lived blips and I sincerely hope that he won't have any more once he goes home! Looking at his feet, you can see in the lower photo the band of new growth about a third of the way down his foot. I suspect that the whole foot once its grown in will have a medial deviation as its that side of his foot which is lacking support at the moment and you can see that the hoof capsule is already tending to try to grow this way. The lateral shoe gives a clue to how big the changes have been and will continue to be. His hairline is less distorted but althought the back of his foot has strengthened he has more work still to do. Comparing the photos over the last few weeks its interesting to see how much the medial side of the foot has changed - much more than the lateral side. Finally a couple of pics for his owner, who wanted to know if Dave really is bigger than Rolie!